Today was my last storytime of the year, and yes, I did do a Christmas theme. I know this is a controversial topic, but as I've explained before, I (and many others) don't share the view that all libraries must be completely sanitized of anything remotely related to Christmas in the name of inclusivity ("And Here We Go Again", "To Holiday, Or Not"). Additionally, my storytimes are all outreach rather than for the general public, and the daycares I serve specifically request holiday and seasonal themes; I see no reason not to give it to them. We started with our usual welcome song, followed by a brief introduction. Normally I would follow that with our story song, which [hopefully] helps them settle down and be ready for our first story, but since I was starting with a very active book first, I saved the song for afterward. and Emma Randall, from a co-worker who had bought it as part of a set for her own children. 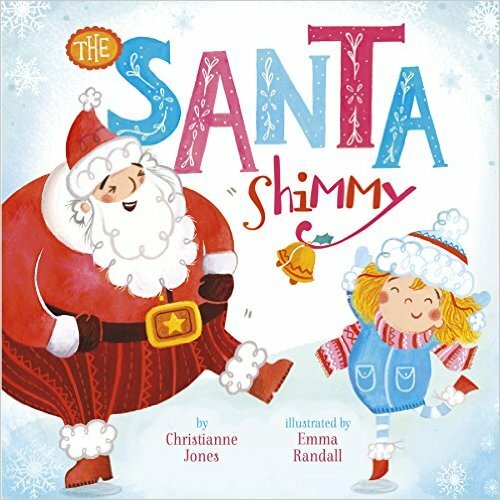 This is a really fun little book with a lot of movement: shimmy, shake, jump, and spin with Santa. I knew they'd have fun with it and *hoped* (perhaps in vain) that it would help get their wiggles out. There are 3 others in the series: The Elf Boogie, The Reindeer Dance, and The Snowman Shuffle. Unfortunately, they are only sold to the general public as board books, but are also available as paperback 8x8's from Scholastic book fairs. I then followed that with our story song, ending with the kids sitting down criss-cross applesauce and saying "shh". I chose a short, simple funny book from Doreen Cronin and Betsy Lewin that came out last year, Click, Clack, Ho! Ho! Ho! This book seems to always work well, since it is short and simple enough for the younger kids, but the humor keeps the older kids engaged, too, and they love the repetition. 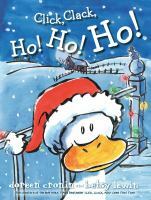 It's Christmas Eve, and Duck is up to something, but what? He climbs the pole and zip-lines over to the roof of Farmer Brown's house, where he promptly finds himself stuck in the chimney. The other animals go up to help and end up getting stuck as well! Along comes Santa; can he get them out or will he get stuck. too?? The more I ham it up, the better they seem to like it! Each time I try to convince them that whatever color I have is good enough, and of course they always insist we have to keep trying. Usually they cheer and applaud by the time Rudolph *finally* gets his red nose. Of course we had to follow the activity up by singing "Rudolph The Red-Nosed Reindeer" and "Jingle Bells" for which I had brought actual jingle-bells for them to use (if you'd like to use a recorded version, I highly recommend Laurie Berkner's). Then we settled back down for our last book, Stowaway In A Sleigh by C. Roger Mader. 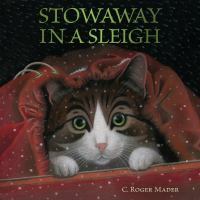 This is a sweet little story about a curious cat who can't resist snooping in Santa's sack, and ends up accidentally being taking home with Santa to the North Pole. This is a nice short, calming story, and since it takes place at night I tell the kids they have to be very quiet. This would be a good bedtime/naptime story. I had hoped it would help the kids settle down a little bit because I try hard to avoid getting them worked up, then leaving the teachers to deal with it. As we prepared to close, I first told them about the special treat I had brought for them since it was Christmas - bags of magic reindeer food that they could sprinkle on their lawn on Christmas Eve to help the reindeer find their way. The "reindeer food" was made by mixing oats, red/green sparkle sugar, and confectionery sprinkles (some use glitter, but we keep everything edible just in case the kids decide to try it themselves). 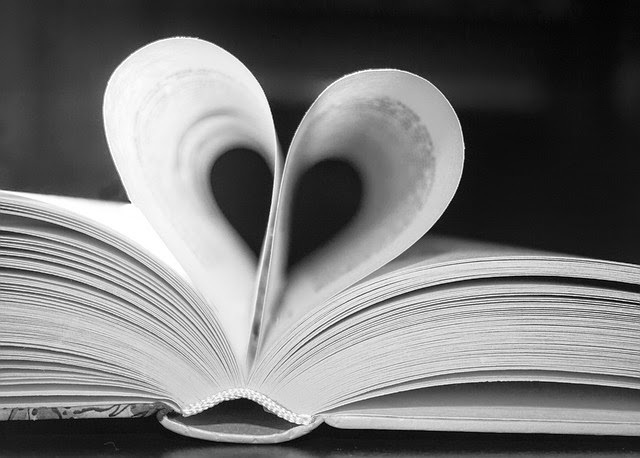 A small amount was placed in a ziplock bag and then inside a small brown paper sack, with a poem that gives instructions attached. I also attached a small candy cane to each (not shown) and reminded the kids that while the candy cane was for them, the food inside was just for reindeer. I gave the bags of reindeer food to the teacher to send home with them, and we sang our closing song and passed out stickers. The kids are always glad to see me, but they were *really* glad to see me today and I was greeted with lots of enthusiastic hugs and cries of "Miss Jennifer's here!" This is the best part of my job, hands down! As to be expected this time of year, they were a little harder to keep engaged and extra chatty. But we made it through and I think they really enjoyed it. 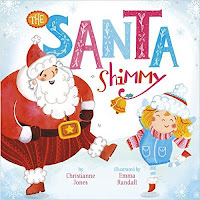 The loved all the movement with The Santa Shimmy, and I found myself wishing I had borrowed at least one of the other books in the series since it was pretty short and they had lots of energy! Like every other group, they really got into Duck's antics in Click, Clack, Ho! Ho! Ho! and predicting everyone else that went up to help would get stuck too, and cracked up at being proved wrong when it came to Santa getting stuck. The ones with cats particularly liked Stowaway In A Sleigh, but I found I had to break my rule about substituting words with that one because they couldn't understand that "Mr. Furry Boots" was how the cat thought of Santa, and were very indignant about it, so to avoid arguments, I just said "Santa" after the first time. The "Rudolph, Rudolph" flannel activity was a big hit as usual, and they loved having the bells for "Jingle Bells". I did accidentally commit one horrific act while I was there, though. Their class elf was hanging from the ceiling, which I wasn't used to being there and forgot about. When we reached up high to stretch between stories, I accidentally touched him, which is apparently a BIG no-no! There were immediate gasps and comments, and hushed cries of"She touched him!" and "Now he'll lose his magic!" I felt so bad, and didn't really know what to say, not being well-versed on the mythology of the elf-on-the-shelf, so just tried to quickly move to the next thing. Luckily only a few saw it and most were not too concerned and the rest seemed to forget it soon enough. Whew!